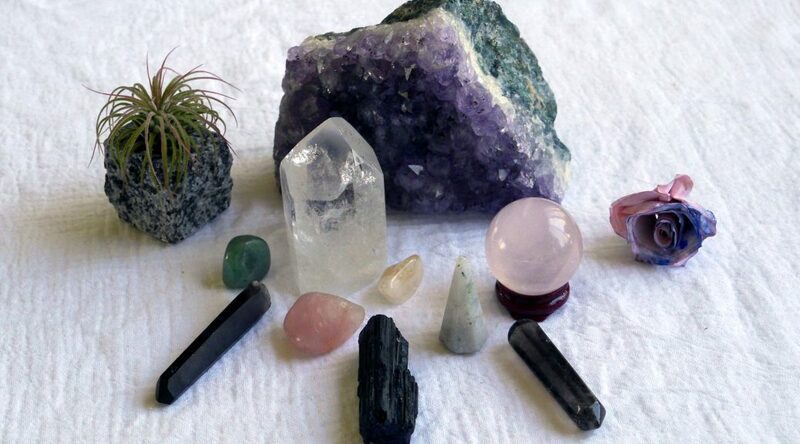 I love crystals for their beauty and their energies. 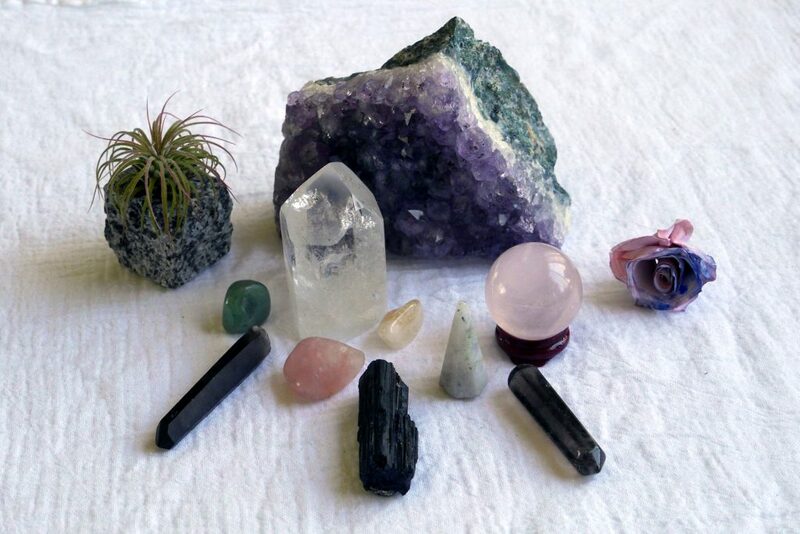 If you want to start your own collection of crystals but don’t know where to begin, then here is a list of what I feel are the seven most essential crystals to have in your collection. I’ll also give some tips on how to find the right crystals and some basic info on how to work with them. I’m going to share some information on each stone, but if you want to go more in depth, a good crystal guide book, such as The Complete Crystal Handbook , or, The Crystal Bible , is always nice to have. A guide book is also great to identify those mystery stones that you probably have. I know I have quite a few of those! This one is almost a no-brainer. If you only have one crystal, this would be the best one. This beauty is my quartz generator. It’s filled with phantoms. Then there’s my reconstituted quartz crystal ball. Clear quartz is an energy amplifier and generator. It is also fully chargeable, so you can basically “program” it to whatever purpose you need, which makes it infinitely useful and a great substitution for other crystals. On its own, it’s a stone that promotes clarity, focus, and connection to your higher self or to guides. You can use it to send energy out or draw it in. When used in meditation, it can help you focus and also help you understand messages from your deities, guides, and higher awareness. There have been times when I needed an answer to something, grabbed my quartz crystal, and the answer seemed to materialize in my mind, fully formed. Clear quartz can also help you see and connect with the faerie realms, as it helps you see past the obvious that might be clouding your vision. Rose quartz is a favorite of many for good reason. It’s a gentle stone, but very powerful. Rose quartz has soothing, calming powers of love and feminine energy. It is gentle, but persistent, breaking down emotional blocks in a way that won’t leave you feeling raw. It works wonders for self-love and acceptance, as well as attracting loving energies into your life. 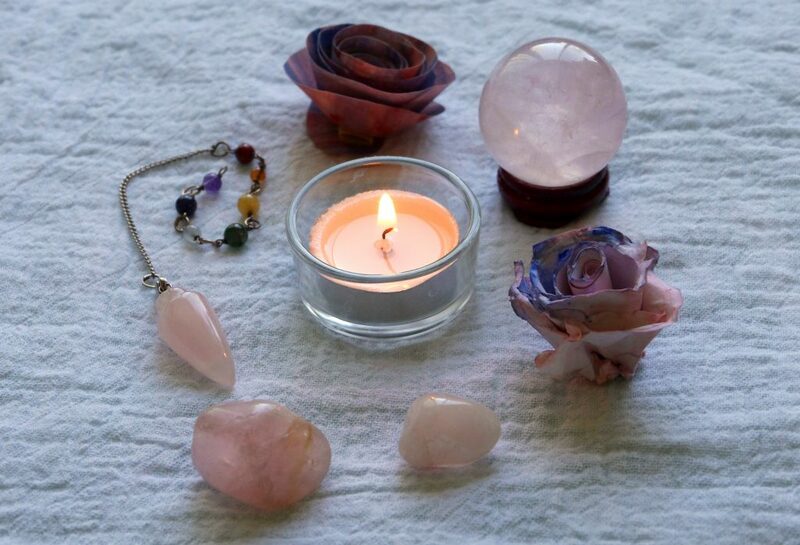 I love the gentle, loving energy of rose quartz. Because of its gentleness, it’s a great crystal for those new to crystal magick and healing, vs. something like Moldavite, whose intensity can leave you feeling like you just got hit in the head with a space rock! (Moldavite is formed from a meteorite impact.) Even so, rose quartz is extremely powerful and is beloved by newbies and seasoned practitioners alike. I can’t get enough of it. The vibrant, deep purple of amethyst just screams “magic!” This stone is associated with the crown chakra. If you want to develop psychic abilities and intuition, then you will want amethyst in your life. It helps with clear spiritual sight and connection to your higher self and spiritual realizations. This beautiful amethyst chunk is one of my favorites, and the bracelet makes me feel magical whenever I wear it. 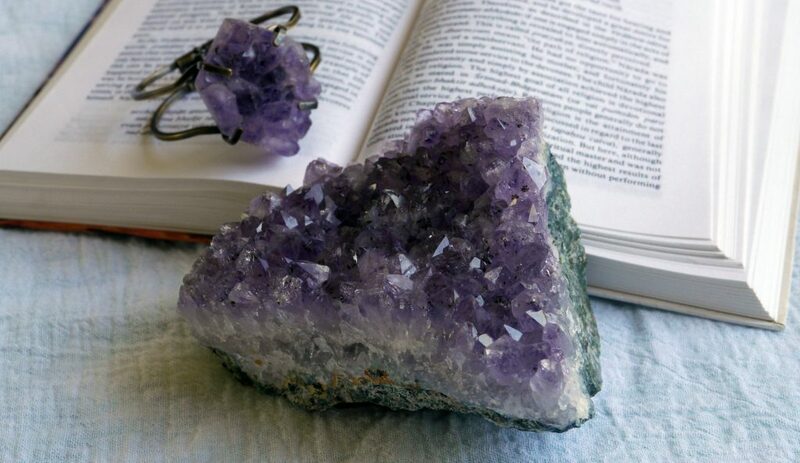 As a dream stone, amethyst works to relieve nightmares and promote lucid dreaming. Sleeping with it under your pillow will bring you peaceful sleep. Amethyst also helps with meditation, and its beautiful elevated vibrational energy soothes anxiety and depression. I know, that’s two crystals. I put them together because both are amazing, but you could choose either one— or both! These crystals are awesome for their powers of protection and grounding— two qualities that are essential for a healer or a magickal practitioner. Both stones are powerful grounders. They transmute negative energies into positive ones and disperse them. They block and repel bad vibes from reaching you by absorbing them. Black tourmaline protects against electromagnetic fields (EMFs) from computers and other electronics. It’s a great stone to keep on your desk. Smokey quartz on the left and black tourmaline on the right. The less-shiny quartz is a lemurian quartz, which I use for a wand. The shiny one is often in my pocket, and the chunk of black tourmaline sits on my desk in front of my computer. When I got my first piece of smoky quartz , I held it for hours at a time and carried it in my pocket. I felt old negative emotions and memories that no longer served me just drain into the crystal, while the crystal emanated peace and love in return. If you’re trying to break through old traumas, this is a great crystal to assist you. These two stones are especially effective for empaths. 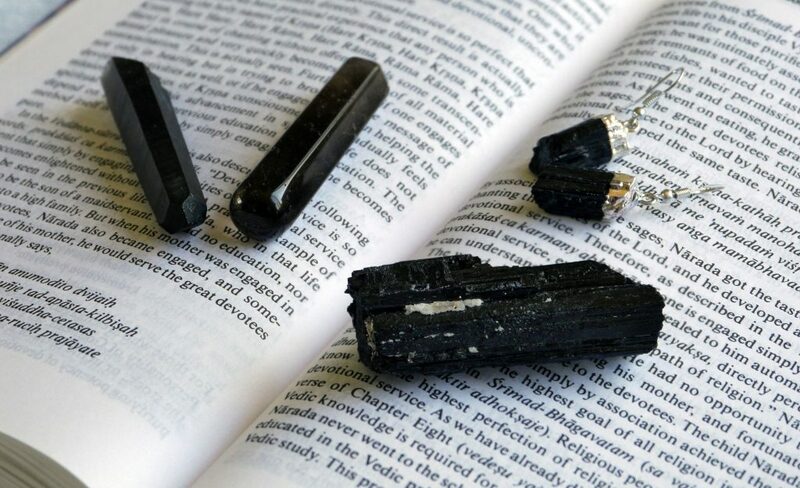 If you feel like other people’s energies and emotions get “stuck” to you and affect you, or if the energies of crowds make you feel emotionally overwhelmed, then get a black tourmaline or smoky quartz. They will help you shield yourself and ground that energy. A bonus to these crystals is that their grounding and transmuting properties means that they don’t really need to be cleansed like other crystals. Citrine carries the bright, joyful energy of the sun. This is just a happy crystal with beautiful orange-yellow tones. It brings clarity and energy and vitality. Citrine is another stone that transmutes negative energies into positive ones. If you’re in a bad mood or feeling low, carry or wear citrine. Citrine also does not need to be cleansed. It’s a perpetual good-mood-giver. 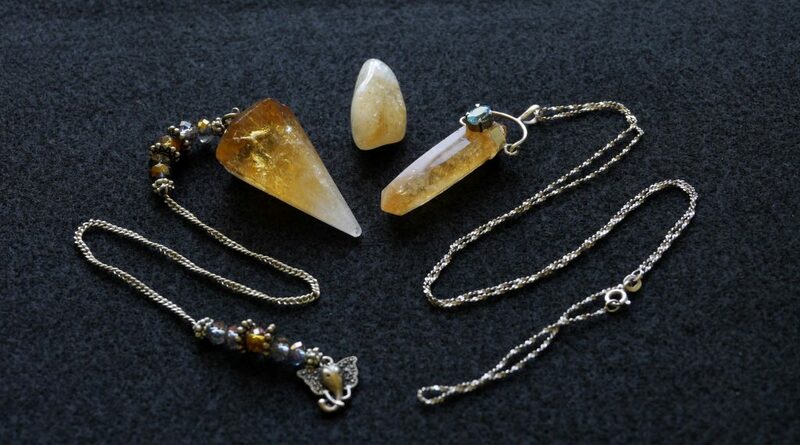 If you’ve read my blog before, you know how much I love this citrine pendulum and this pendulum necklace! This is such a happy stone. Not only is citrine the crystal equivalent of a good laugh, a bear hug, and a bunch of sunflowers in a sunbeam, but it protects from jealousy and spite. It is a manifestation stone that can help you attract and keep wealth. It can also help you with the confidence and motivation to get stuff done. Also, it clears ghosts! I’m not kidding. If you have a lot of paranormal “house guests” that need to find a new vacation home, get some citrine. There are a few things you should know about citrine before buying some. A lot of “citrine” is actually heat-treated amethyst. So, make sure you’re getting genuine citrine. Like amethyst, citrine will fade in the sunlight, so try to keep it out of direct sunlight. 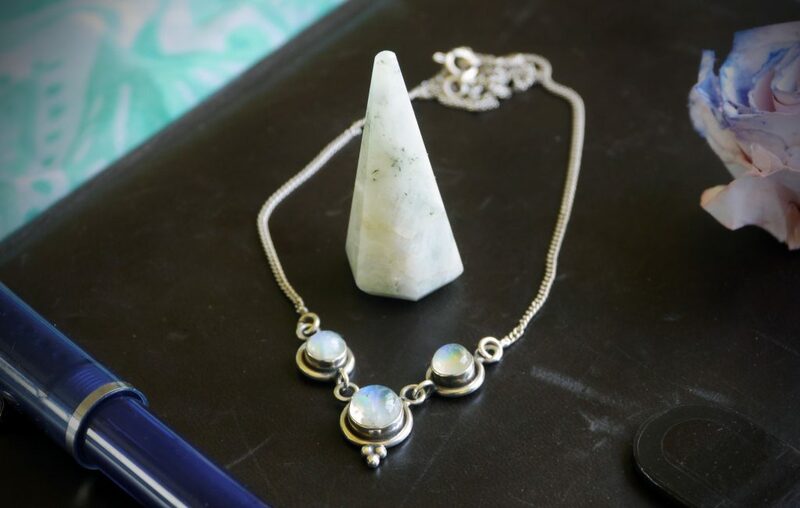 Moonstone’s mysterious glow connects to, guess what— lunar energies. Also, it carries water energies. It comes in several colors, even a peach/pink hue, but most people are familiar with rainbow or blue moonstone . This is an emotionally balancing crystal that calms stress and helps to enhance your intuition. I’ve worn moonstone since I was a teenager, and I know it helped me deal with all that teenage stress and angst. It brings clarity, inspiration, and love and sensuality. The moonstone point was a pendulum that broke, now I use it in grids. This is what most raw moonstone not used for jewelry looks like. The necklace is one of my favorite moonstone pieces. I love the blue flash! The combination of moonstone and rose quartz is an amazing feeling of love, strength, and feminine energy. 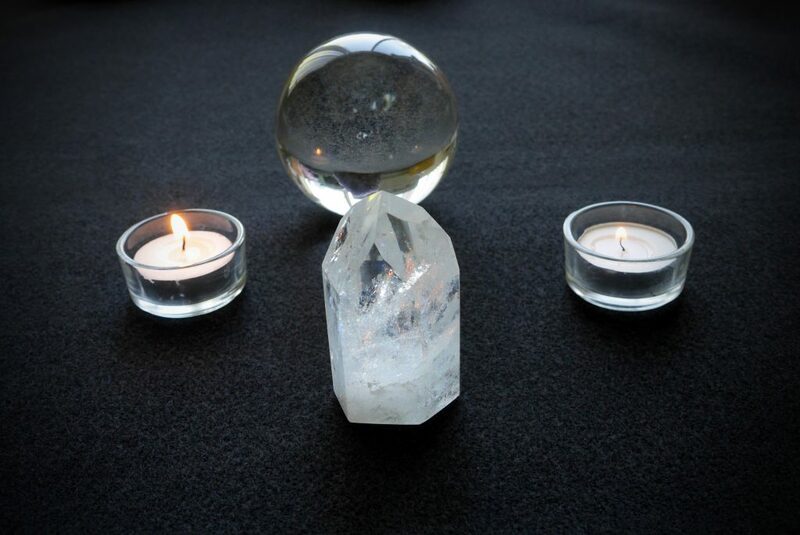 Add a clear quartz to the mix to amplify the energies and you have a very powerful goddess vibe. Because of moonstone’s connection to lunar and water energies, it’s a great protection stone for travel by night or over water. If you tend to be very mental, moonstone will help you connect to your intuitive powers. 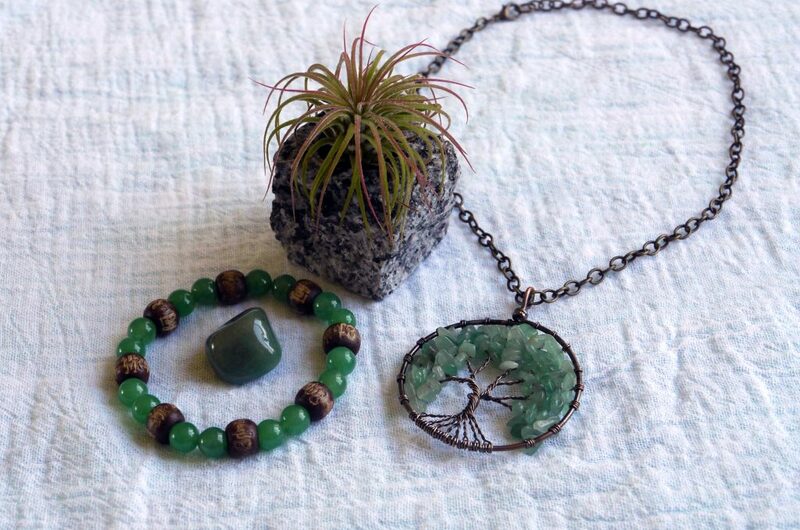 Aventurine comes in a few different colors— red, blue, and green most commonly. However, I’m including the green variety in this list because it’s just a powerhouse of awesome. The color is a rich, hypnotic, almost sea green to a deeper forest green. Commonly used to connect to faerie and elementals, green aventurine has deep earth and nature connections . Its earthy properties make it a perfect stone for manifesting wealth and opportunity as well as creativity. “Lucky stone” just doesn’t do this crystal justice. My husband got me this beautiful green aventurine necklace Tree of Life for Christmas and the bracelet on a trip to Sedona. This is a really amazing crystal. Green aventurine is not just for money luck, but for good health too. As a heart stone, it helps to gently clear emotional blockages and negative patterns that hold you back. Green aventurine brings healing energies into the physical realm, in the form of its anti-inflammatory properties, it’s ability to stimulate the metabolism, and it’s reputation for neutralizing EMF pollution from all the electronics most of us are continually exposed to. It’s even good for respiratory health. Green aventurine releases emotional and physical manifestations of negativity. If you want a stone that will help you actually transform yourself into a more positive, healthy, happy, and fortunate person, this is the stone for you. Ideally, you want to be able to see and hold the crystals you’re thinking of buying. Often, a particular crystal will draw you to it. Sometimes when you hold it, you’ll feel a buzzing vibration, or a coolness, a tingling, or a gentle warmth. That’s a sign that the crystal’s energies are connecting with your own. If you can’t get to a crystal shop, no worries. I have used the same technique for “feeling” for a particular crystal to find them online. For example, I know I want a rose quartz, so I concentrate on finding the best rose quartz for me. I keep this intention in my mind as I look at crystals online. When a particular listing grabs my attention, I know that I’ve found my crystal. I’ve had excellent results finding crystals both on Amazon and Etsy. There are benefits to both. Amazon tends to have much lower prices. Just read the reviews to see what people think of the quality. Also, returns are no problem if you get a dud. For Etsy, you can message the seller and ask them to pick the stone that feels like it wants to belong to you. Ninety-nine percent of merchants who sell crystals will understand what you mean and will be happy to do this. You can also find your favorite shops this way. It really doesn’t matter if the crystal you chose is a tumbled stone, a point, or a piece of jewelry as long as it resonates with you. A double-terminated quartz point is great for certain things, but if all you have is a smooth tumbled clear quartz that you really love, then it’s the perfect crystal to use! When you get a new stone, it’s a good idea to cleanse it. My favorite ways to do this are to pass it through incense smoke or sprinkle it with water. Running water from a stream works best, but you can use charged moon or sun water, or even filtered tap water. I’m careful about using salt to cleanse crystals, because some, like selenite, don’t do well with salt. You can also cleanse it with sunlight, moonlight, or even sound. I’ll chant the Maha Mantra* over anything that needs cleansing and that banishes all kinds of unwanted energy. A collection of my most essential crystals to use in magick and healing! After you’ve cleansed your stone, you can charge it with intent. Carry the stone with you or work with it so that it recognizes your energies, much like you would do with a new tarot deck. Each crystal has its own personality, and over time you’ll know right away which to use for a particular purpose, even if the properties of that crystal don’t necessarily “match” your intentions, that particular crystal just might. But, you’ll only know that by getting to know your crystal! One more thing, when you take this list on a crystal-shopping adventure, and you find another stone that really jumps out at you, then get that one. Or, if you pick up a moonstone or aventurine and think, “nah, this doesn’t do it for me,” then it isn’t the crystal you need. This is a good place to start and the crystals that I feel are essential, but you might have a different list, and that’s cool too. I hope this list is helpful to you. If you already work with crystals and have different suggestions for your “must haves,” then please let me know in the comments below! What is your favorite crystal to work with? And is there one that just doesn’t call to you? I really think turquoise is beautiful, but I’ve never felt drawn to use it. I came across you website and I see that you sell Indian crystals products. I am manufacturer of the same and would like to be your supplier. I can compete with your current prices. Zeolites – By exclusive pieces, by Kilo and flats. Rough Stones in 20-40 gram sizes and big sizes as well..
Should you be interested I can send my catalogue for the same. Aeora Rocks Exports Pty Ltd.